Launched: 11 February 2007. Last updated: 28 March 2007. For those of us who are drawn to, even obsessed with, a subject, a good encyclopedia is always useful. In my case the subject is Antarctica and specifically the cultural, historical, bibliographical side of things, and less so, the scientific. I'm always needing to check a fact quickly without wading through a pile of books. When was Borchgrevink born? What was the original name of Filchner's ship? When such questons arise I turn first to an encyclopedia. 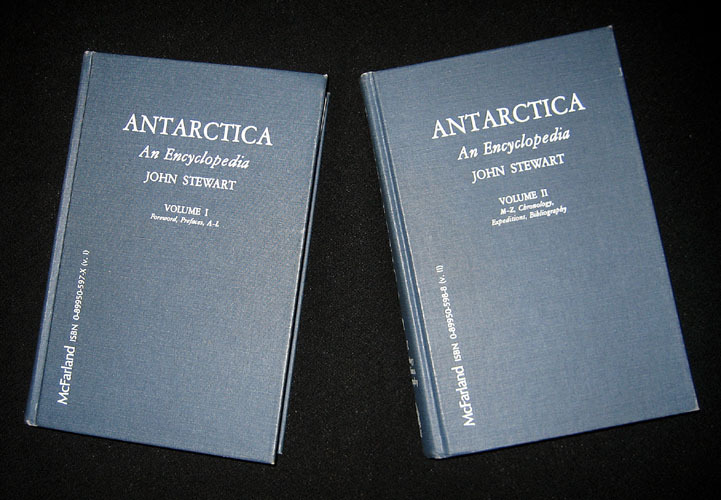 For some years since its publication in 1990, John Stewart's two-volume Antarctica; An Encyclopedia has served me well, and continues to do so. But since then several other titles have appeared. Some are bi-polar; others specifically Antarctic. Some have a scientific emphasis; others historical. What they all have in common are entries of various length, arranged alphabetically. UPDATE: My investment has just gone up by $204 for a new total of $1,282.82. I decided having Vol I makes sense in that now I have the complete set and there are some Antarcticans included. There are books that somewhat resemble encyclopedias in content but not in format. Among these are Antarctica; Great Stories from the Frozen Continent by Reader's Digest (Surry Hills, N.S.W. : Reader's Digest Services Pty Limited, 1985) and Antarctica: the Complete Story by David McGonigal and Lynn Woodworth (Willoughby, N.S.W. : The Five Mile Press, 2001). The former is out-of-print and the latter appears to be as well, although secondhand copies are easily found. Another title that's somewhat in the encyclodpedia genre is the Chronolgical List of Antarctic Expeditions and Related Historical Events by Robert K. Headland (Cambridge: Cambridge University Press, 1989). This is out-of-print although a new edition is in preparation. NOTE: To see four selected entries taken from each of the titles for comparison purposes, click here. NOTE: To see a comparative listing of entries, click here. NOTE: The photos below show the books opened to the entry for Robert Scott. Binding: Saifu cloth, upper cover and spine with lettering in gilt. Paper: No statement can be found as to whether the paper is acid free. The publisher's website is very well conceived and executed. Not only is the usual information on the title available but a listing of all the major articles is included as well as a listing of other persons mentioned, ships mentioned, reviews, etc. One can request by e-mail one article which is a very helpful feature. Notes:	The title is part of a three-volume series, of which this is the most recent. The other titles are: Encyclopedia of Exploration Part 1: to 1800 and Encyclopedia of Exploration [Part 3:] 1850 to 1940 The Oceans, Islands and Polar Regions. Part I, which has not been examined, includes entries for James Cook, the Forsters, Edmond Halley, William Hodges, Yves-Joseph Trémairec de Kerguelen and Anders Sparrman, and perhaps others I missed. 524 articles in about 700,000 words. Typical Entry:	Number, Name, Inclusive dates of the expedition in question, Region, and Text, concluding with a bibliography. Example: W18 WEDDELL, James 1819-1824 Antarctica, South Orkneys & South Shetland Is. The entries are laid out in double columns throughout. A total of 25 entries representing ca. 35 pages out of 671 or 5% of the book is devoted to the Antarctic. No doubt an equal or greater percent is devoted to the Arctic. See below under the same title, Part 3, for author informawtion, blurbs and reviews. See below under the same title, Part 3. Encylopedia of Exploration [Part 3:] 1850 to 1940 The Oceans, Islands and Polar Regions. The publisher's website is very well conceived and executed. Not is the usual information on the title available but a listing of all the major articles is included as well as a listing of other persons mentioned, ships mentioned, reviews, etc. One can request by e-mail one article which is a very helpful feature. Notes: The title is part of a three-volume series, of which this is the most recent. The other titles are: Encyclopedia of Exploration Part 1: to 1800 and Encyclopedia of Exploration [Part 3:] 1850 to 1940 The Oceans, Islands and Polar Regions. Part I, which has not been examined, includes entries for James Cook, the Forsters, Edmond Halley, William Hodges, Yves-Joseph Trémairec de Kerguelen and Anders Sparrman, and perhaps others I missed. Example: S12 SCOTT, Robert Falcon 1901-1904 Antarctica. The entries are laid out in double columns throughout..
A total of 35 entries representing ca. 113 pages out of 703 or 16% of the book is devoted to the Antarctic. No doubt an equal or greater percent is devoted to the Arctic. Note: Having just gone ahead and purchased Part 1, I'm adding some information on it. Encylopedia of Exploration [Part 1:] To 1800. Notes: The title is part of a three-volume series, of which this is the first volume. A fourth volume (continental exploration) is in preparation. The other titles are: Encyclopedia of Exploration Part 2: 1800 to 1850 and Encyclopedia of Exploration [Part 3:] 1850 to 1940 The Oceans, Islands and Polar Regions. 2,327 articles in about 1.2 million words. Typical Entry:	The same format as with subsequent volumes. He has travelled widely through Europe, the Middle East, Central Asia, India, West Africa and South America, following in the footsteps of the explorers, seeking out local sources of information, and adding to a lifetime's accumulation of travel literature. He is now working on the final section of the work, covering the period 1850 to 1940. Published in three parts to date (Part 1: to 1800, Part 2: 1800 to 1850, Part 3: 1850 to 1940 (Oceans)) it includes a catalogue of all known expeditions, voyages and travels for the periods covered, as well as biographical information on the travellers themselves, which places them in their historical context. 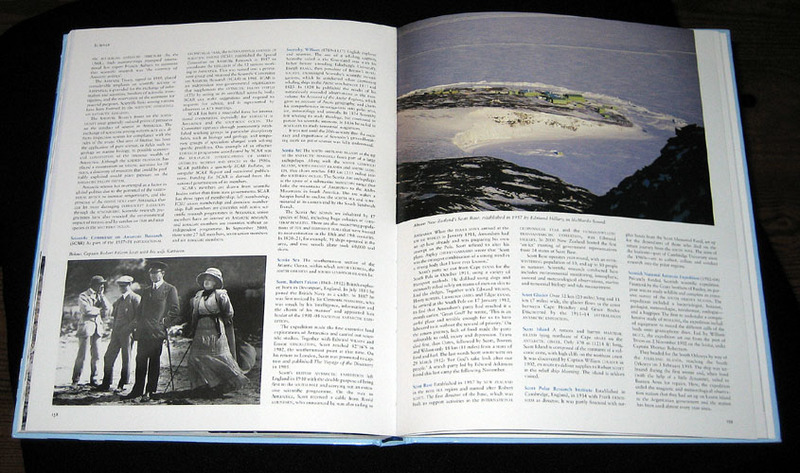 Encyclopedia of Exploration, 1850 to 1940: The Oceans, Islands and Polar Regions, by Raymond John Howgego; Hordern House Rare Books, 2006, $245. Raymond John Howgego's 'Encyclopedia of Exploration' has, in the five years since publication of the first volume, established itself as a major, if not the major reference work, of exploration, travel and colonisation. Howgego notes, in the Introduction to this third volume, that he had originally intended to complete his work in one volume but the required "degree of thoroughness" meant that more volumes were required than originally anticipated. The first part covered the period to 1800 and the second 1800-1850. Both volumes are still available from the publisher, Hordern House (www.hordern.com). This third part 1850-1940 is subtitled 'The Oceans, Islands and Polar Regions', while a fourth part, scheduled for 2008, will be subtitled 'Continental Exploration' and will deal with continental and land exploration from 1850-1940. Howgego, an independent scholar, who has gained the acclaim of many of the world's leading historians in the history of travel and colonisation for this series, could be termed a 'renaissance man', combining training as a physicist with a reading knowledge of every European language except Basque and Finnish. In the period 1850-1940 it was clear to Howgego that most explorers and travellers restricted their journeys to specific parts of the world or climatic regions. He notes, "those who chartered the world's oceans rarely ventured far onto dry land, while others who explored the interior of the larger islands hardly ever penetrated the continental mainland". The cut off date of 1940 also allows the flights of pioneer aviators to be included but ensures exclusion of the plethora of tourist accounts after that date. Howgego believes in completeness. Thus "every expedition to Antarctica has been documented in detail, and with respect to the Arctic, little or nothing is missing". The current volume includes a large number of articles devoted to particular islands or regional groups. Antarctica, the Arctic, New Zealand and Papua New Guinea are specifically highlighted by Howgego as being particularly strong in coverage and citation. He believes that the coverage contained in the articles on New Zealand, from this and previous volumes, "would alone constitute probably the most comprehensive account of New Zealand exploration ever written". In this context, when Howgego's magisterial reference work is completed, the availability of such linked material via the web, perhaps on a pay for view basis, would be invaluable. Howgego follows the pattern familiar to readers of the first two volumes, namely an alphabetical approach to individuals, topics and places. Every expedition is placed within an historical context with cross references linking articles of similar content. In all, the volume contains 521 articles in about 700,000 words, with the bibliographies citing more than 14,000 works of reference. The indexes provide links to nearly 3,000 travellers. Scholars, librarians and booksellers will avidly continue to travel with Howgego and Hordern House to this journey's triumphal end. WITH ALMOST bewildering speed, the third volume of Raymond Howgego's Encyclopedia of Exploration has appeared, covering a century of exploration of the oceans, islands and polar regions, from 1850 to 1940. It is, once again, a polymathic achievement, testifying to the compiler's energy, language skills and his own dedication to a life of travel to the far corners of the earth. For Howgego, an Englishman, is no armchair traveller. As he records the achievements of past explorers and travellers he does so with the insight into what it means to have rounded the Horn, to have seen where Speke found the source of the Nile, and to have crossed the Torugart Pass from Kyrgyzstan into China. A background as a teacher of physics underlines his concern for accuracy, but it his yen for travel that shines through in this, as in previous volumes. Small wonder that his achievements have led to his becoming a Councillor of the Hakluyt Society. As Howgego makes clear in his introduction to the book, the century under review was distinguished by several distinctive characteristics that set it apart from the periods treated in his earlier two volumes. From 1850 onwards travel and exploration increasingly extended beyond the temperate continents to encompass regions that had been visited before, but frequently only briefly. Of particular interest for an Australian readership is the extent to which the exploration of the interior of New Guinea took place after 1900. For a broader Australasian audience it is noteworthy that New Zealand's South Island falls within the category of being part of the later phase of exploration. Although the North Island was well known by the middle of the nineteenth century, it was after 1850 that the South Island was charted, as gold miners and graziers moved across the central mountain spine to the western part of the island. The period covered by this third volume also saw the emergence of photography as a recording tool, the eventual use of aircraft for aerial mapping, and the increasing presence of women among the ranks of long-distance travellers, not least the indomitable Isabella Bird. As the son of a geologist who studied under Sir Tannatt William Edgeworth David and who still holds memories of meeting Sir Douglas Mawson as a child, for me the sections on the exploration of the Antarctic hold a special fascination. Reading of David and Mawson, of Shackleton and of Scott, it is sobering to realise that their heroic endeavours took place barely a century ago and to contemplate how severe were the privations that they overcame. The sections dealing with the exploration of New Guinea are no less fascinating. Nowadays there is a disturbing lack of Australian interest in that great island, except by those who support the "Free Papua Movement" in ways that imperil Australia's relations with Indonesia. For instance, how many Australians are aware of the early expeditions that opened up the interior and are detailed here: the work of Charles Karius and Ivan Champion in 1926 and 1927, and of Jack Hides and James O'Malley in 1935? Dwelling on the regions of the world just noted reflects the reviewer's interests, but there is something in this volume for everyone. While the ill-fated expedition of John Franklin in search of the Northwest Passage was covered in the second volume of the encyclopedia, the first series of search expeditions have their rightful place in the present volume. The extent to which much of the Pacific remained outside the claims of European and American powers until late in the nineteenth century is made clear. As Howgego correctly observes, "British and French governments saw little urgency in taking responsibility for what they regarded as distant collections of small islands of scant economic value ..." As with the previous two volumes, there is a real pleasure in coming upon an explorer or traveller whose name and exploits were previously unknown to this reader. I cite just two, Elizabeth Bisland and Hector James. The first sprang from Louisiana's plantation class, worked with Joseph Pulitzer's New York World, and then for its rival, John Walker's Cosmopolitan. When, in 1889, Pulitzer decided to sponsor an attempt at a round-the-world travel record by his employee Nellie Bly, Walker sent Bisland off as a competitor in the opposite direction. Missing a boat in Le Havre, Bisland arrived back in New York four days after Bly had returned in seventy-two days, to miss out on Bly's fame, and to retire to genteel anonymity. Hector James, whose name will undoubtedly be known to New Zealanders, was born in Edinburgh, where his lawyer father was an associate of Sir Walter Scott's, for whom the elder James translated and transcribed old manuscripts. Although trained as a medical doctor, James made his name as a geologist and his importance as an explorer comes, unusually, from expeditions in both Canada and New Zealand. In the latter he played an important part in opening up a crossing from the west to the east coast of the South Island, in 1863, under severe conditions, later becoming the director of the Geological Survey and Colonial Museum in Wellington. The volume, like its predecessors, is beautifully produced, robustly bound, with the present-day rarity of silk marker ribbons. It is a credit to both the compiler and to its publishers. It is striking to record that once the final volume in this series is published, the total of text will run to some four million words, which will make the encyclopedia one of the longest single-authored works in the English language. With quality matched to length, it is a notable achievement that this publication should be taking place in Australia. Milton Osborne, an adjunct professor in the Faculty of Asian Studies, the Australian National University, and visiting fellow at the Lowy Institute, has written extensively on the exploration of the Mekong River. 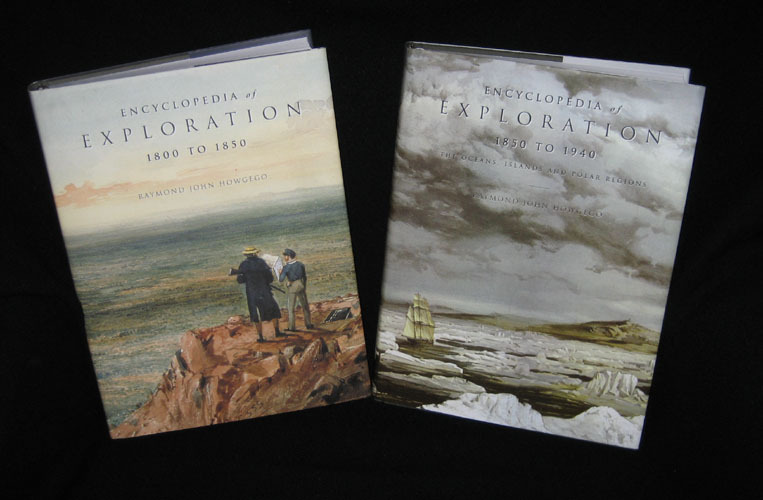 He reviewed the previous two volumes of The Encyclopedia of Exploration in the April 2003 and December 2004 issues. All three volumes are available from www.hordern.com/publications/explorers.htm. NOTE: A review by Beau Riffenburgh appears in the Polar Record, vol 43, No 1, pp 75-76. What's immediately obvious is that this 3-volume set is beautifully produced. The paper, binding, design, printing and presentation are all of high quality. With regard to these points it far surpasses the other titles which are serviceable but not overly handsome. It's a pleasure to hold these volumes. Possibly the most impressive thing about this effort (apparently a 4th volume is planned) is that it's been undertaken by one person and not a stable of contributors. The writing is elegant and a joy to read. I personally don't care for the way dates are presented (e.g. "On 23.11.35 Ellsworth and. . .") but that is small point. One very often comes upon facts that don't appear in any of the other titles. In just one example, who knew that Richard Byrd "had come face to face with bandits in the Philippines"? Unlike some titles, the entries on people do not concentrate just on the Antarctic portion of their lives, but give details on what came before and after, making for a far fuller and more interesting entry. The volumes are large and heavy and the text somewhat smaller than the other volumes but this doesn't seem to hinder their use. They easily lie flat. The entries are generally longer than in other titles (nearly 2-1/2 pages per average entry) and the persons or subjects treated are necessarily more selective, although many persons and subjects are mentioned in the entries for others and can be found using the indexes. The lack of maps or illustratons may be considered a disadvantage by some. On the other hand, it has been possible to include more text by leaving them out. Although not in itself a disadvantage, the fact that the coverage not only includes the Arctic but the rest of the world, means that there is more material here than the typical Antarctican will want or need. It would be nice to have an electronic version of some sort. The only title that offers this option is MILLS. Unlike most of the other titles, there is no supplementary material such as an exploration timeline which would be useful and not difficult to produce. The bibliographies at the end of each entry are thorough and comprehensive and far more extensive than any other title. The first entry in the ANTARCTIC EXPLORATION: HISTORICAL OVERVIEW section is Aagaard's Fangst og forskning i Sydishavet which is largely unknown, in Norwegian and very scarce—but also one of the great works of Antarctic scholarship. Few errors in the bibliographic entries jumped out at me. Bob Headland's Chronological List is mentioned, specifically the second edition of 2005. That's wishful thinking! Bob is still carrying around the galleys and still is having 'problems' with maps. The entry for Frederick Cook has him attending the College of Physicians and Surgeons which is part of Columbia University not New York University. A small and unimportant point. Without having read most of the entries, it's hard to know how frequently one would come upon errors, but my hunch is that it would be rare. Illustrations:	Some black and white illustrations mostly historic. Other features: Also available as an e-book at $230. Includes details on the e-book version. Typical Entry:	Name (followed by birth and death dates) or title followed by Text followed by a 'See also' section and 'References and Further Reading.' Those entries prepared by others are signed. The entries are laid out in two columns throughout. Generally expeditions are included in entries for the leader rather than the name of the expedition. The next decade will see centennial celebrations marking the heroic age of the great polar explorers: Robert Falcon Scott, Roald Amundsen, and Sir Ernest Shackleton. From Pytheas's voyage to the Arctic Circle in 325 B.C. to Børge Ousland's solo crossing of the Arctic Ocean in 2001, the history of our quest to conquer the poles is filled with tales of courage, inspiration, tragedy, and triumph. 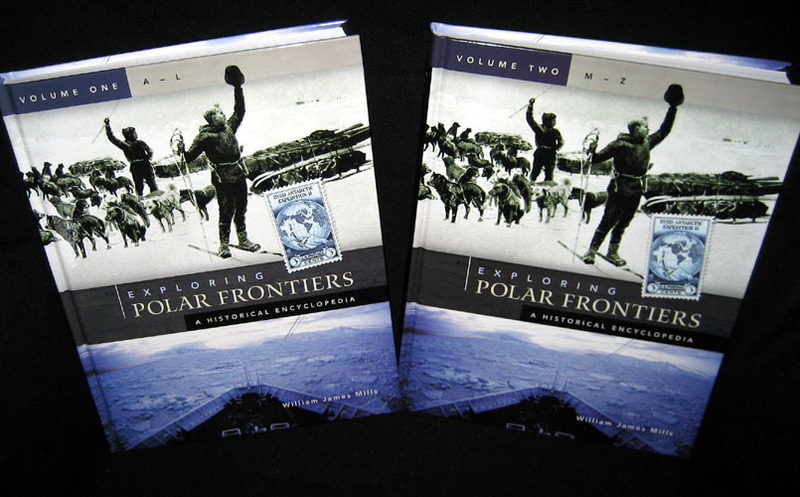 Exploring Polar Frontiers: A Historical Encyclopedia is the only reference work that provides a comprehensive history of polar exploration from the ancient period through the present day. The author is a noted polar scholar and offers dramatic accounts of all major explorers and their expeditions, together with separate exploration histories for specific islands, regions, and uncharted waters. He presents a wealth of fascinating information under a variety of subject entries including methods of transport, myths, achievements, and record-breaking activities. By approaching polar exploration biographically, geographically, and topically, Mills reveals a number of intriguing connections between the various explorers, their patrons and times, and the process of discovery in all areas of the polar regions. Furthermore, he provides the reader with a clear understanding of the intellectual climate as well as the dominant social, economic, and political forces surrounding each expedition. Readers will learn why the journeys were undertaken, not just where, when, and how. • Examines the intellectual, social, economic, and political forces surrounding each expedition." When I first obtained a copy of this title and consulted it a few times I concluded that it really wasn't very helpful. I seemed to seldom find what I was looking for. I've since concluded otherwise. Like HOWGEGO, MILLS has fewer entries than some titles but they are longer, nearly as long as HOWGEGO (an average of 2.23 pages versus 2.47). So it's not particularly suitable for quickly looking up some fact like the spelling or a name or a birthdate. The Timeline in Vol II is not particularly useful although the concept is fine: Dates on one side and geographic region along the top. But the entries themselves are merely last names with no commentary (e.g. Cooper alone rather than Mercator Cooper, first documented landing on the Antarctic continent). The 'Entries Listed in Chronological Order' in Vol I is more useful as some descriptive information is included. The Advisory Committee and Contributors are all knowledgeable. Entries by the Contributors are signed but these are not numerous so most of what appears was apparently the work of William Mills. The few black and white illustrations are generally well-selected and complement the text well. The 'Selected Bibliography' is lengthy and comprehensive. Other features: There appears to be no electronic version. Not nearly as informative about the title as the Hordern House site. Notes: Emphasis is primarily on science. Typical Entry:	Name or title followed by Text followed by a 'See also' section and 'References and Further Reading.' Example: SCOTT, ROBERT FALCON. In this instance the entry gives no information on his childhood or early years in the Royal Navy. The entry is two pages in length. All the national scientific programs and stations are described. "The Antarctic is unique, geographically, politically, and scientifically. It is the most remote, hostile, and dangerous continent, while at the same time it is the most pristine and least developed. Antarctica is the only major part of the Earth's landmass not directly governed by one nation, but under the control of a Treaty, with a multitude of acceding nations. 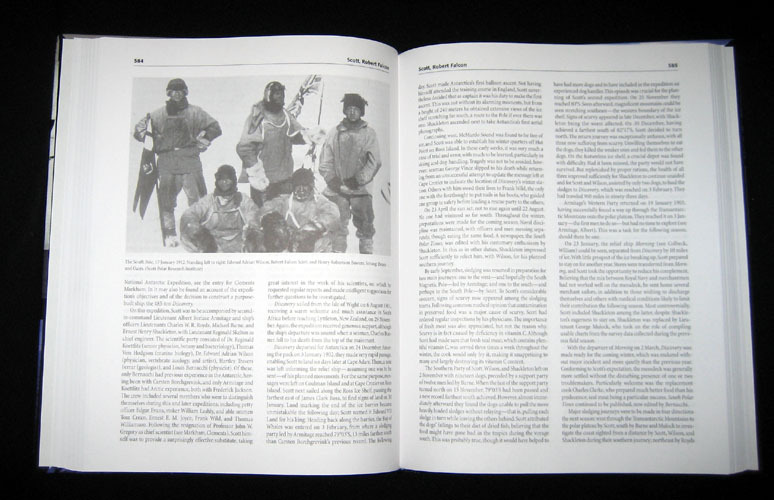 The Encyclopedia of the Antarctic discusses scientific activities and topics, but the 'human element' is also a significant part of the work, with entries on history, politics, legal issues, national research programs, scientific bases, historic huts, the United Nation's 'Question of Antarctica,' compliance with the Environmental Protocol, and tourism." 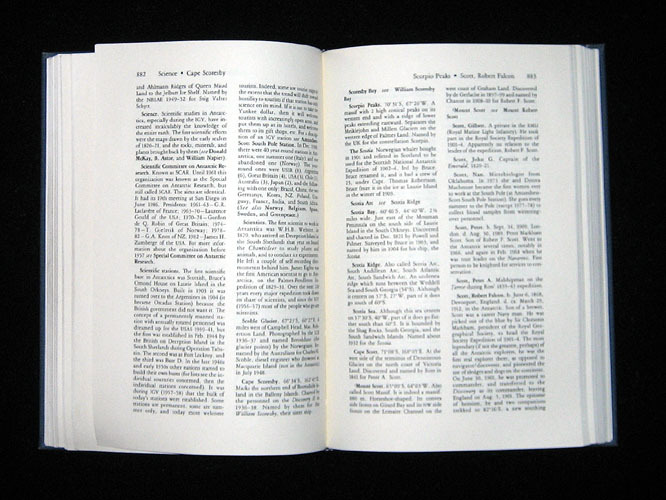 The Encyclopedia of the Antarctic comprises 495 free-standing, alphabetically ordered entries of 500 to 6000 words in length. 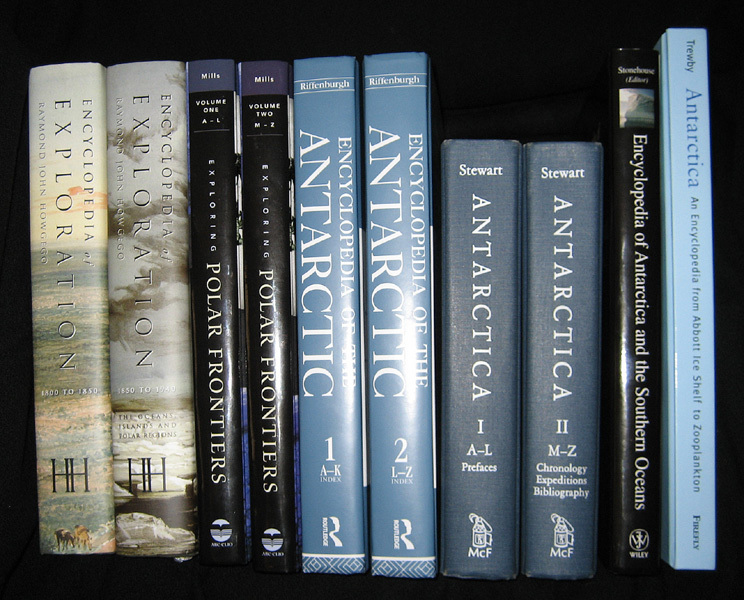 These range from factual, data-driven entries, such as biographies, wildlife details, and statements about national Antarctic programmes, to longer overviews on major themes and analytical discussions of issues that are of significant interest to both scientific rsearchers and the general public, such as climate change, conservation, geopolitics, biogeoography, and pollution. This title—the newest of the lot—has a lot in common with MILLS. The overall design, look and feel are very similar (2 volumes, binding, page layout.) There are almost no illustrations, however. For Antarcticans, the advantage of this title is that it's exclusively Antarctic. This title has more entries (of an historical/cultural nature, that is) than either HOWGEGO or MILLS but less than the others. The average length of these entries is 1.8 pages. The historical/cultural entries make up approximately 20% of the book The Contributors are numerous and impressive; among the leading lights of their respective fields. The list stretches over 10 pages. Although the historical/cultural side of Antarctic exploration is certainly covered well, it is the scientific side of things that is the focus of this title. This makes it unlike the other titles. The Appendices are useful although mainly to the scientific user. The Chronology of Antarctic Exploration is excellent, beginning in 1487 and ending with the IGY 1957-58. It focuses exclusively on expeditions and voyages and includes is the date, name of the expedition or voyage, the leader, the name(s) of the ship(s) and the accompishments. My biggest complaint with the set is it's price: $425, the highest price of any of the titles discussed here. Being the newest title, there should be an electronic version but apparently not. Publisher:	Jefferson, North Carolina, and London: McFarland & Company, Inc.
Price:	Out-of-print. ($113 or more; one source says $200 was published price). (12 copies on AbeBooks.com ranging from $20 (1 of 2 volumes) to $206.25. Other features:	Because of size, easier to use than other, larger encyclopedias. 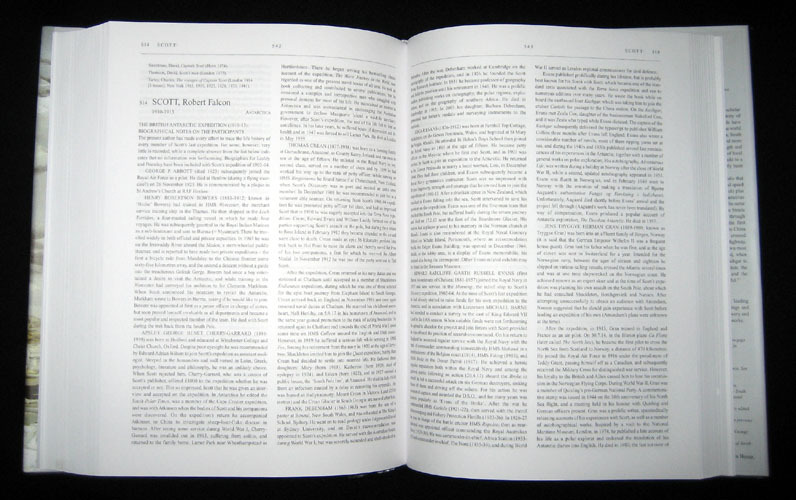 Notes: Based on the average number of entries of 10 selected pages (14.5), this encyclopedia has about 16,000 entries. Timeframe: The Chronology in Vol II starts in 1502 and ends in 1990. Typical Entry:	Name or title followed by Text. In the case of places, the longitude and latitude are given. Based on the average number of entries of 10 selected pages (14.5), this encyclopedia has about 16,000 entries. A very large proportion of the entries are topographic. 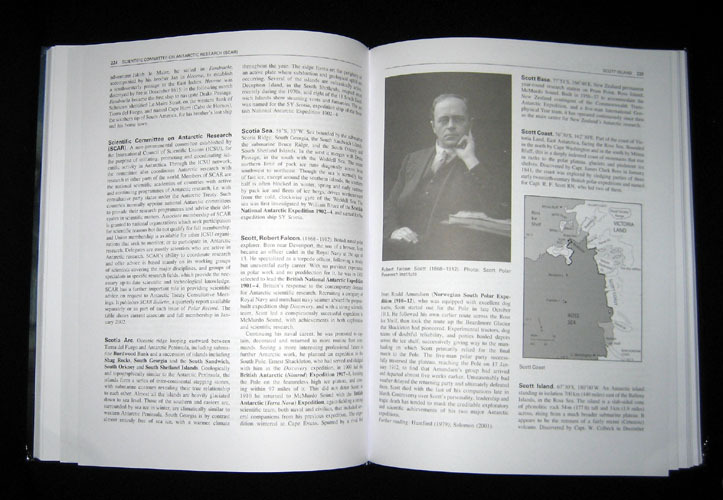 STEWART's two-volume encyclopedia was the first one to appear (1990) and for a quick reference, it remains the most handy. Why? Well, the actual volumes are smaller and more easily handled and pulled off the shelf to look up something without a lot of fuss. But undoubtedly, it's biggest attribute is the number of entries: too many to actually count but by counting a typical ten pages and multiplying, I come up with 14,000 entries. (The runner up is STONEHOUSE with only 260.) This, of course, means the entries are noticeably shorter than the competition: less than a tenth of a page (the shortest in the group) versus about 2-1/2 pages for the longest entry (HOWGEGO). But the shortness of the entries serves a purpose here: fast reference. The number of entries has the advantage of upping ones chances when looking something up. Although the answer may lurk in a larger entry in one of the other encyclopedias, one has to hunt for it. In STEWART, it's usually there, alphabetically, easy to find. Some have pointed out that STEWART isn't always absolutely accurate. Like RIFFENBURGH, STONEHOUSE and TREWBY, it's exclusively Antarctic. Like HOWGEGO and TREWBY, this effort is almost exculsively the work of one person. That's neither good nor bad, but it certainly is impressive. Some have said that STEWART has lots of errors. Yes, I have found some: in the entry for the British Imperial Transantarctic Expedition (Endurance), Stewart says Shackleton, Crean and Worsley showed up "at an astonished Grytviken" when, of course, it was Stomness (p. 134). Albert Armitage's middle initial is B not P (p. 40). Gregory is noted on p. 408 as "director of the civilian staff" on Scott's Discovery expedition. He was appointed to head up the scientific staff, but resigned once he learned he would be serving under Scott and thus never actually was on the expedition. On p. 248, Edwin De Haven, a member of the US Exploring Expedition, is entered as Edmund H. De Haven. And on page 429, the steward on the Discovery was Clarence not Charles Hare. Minor errors for the most part, but after awhile as they creep up, one has to be somewhat cautious. There are some interesting subject entries (see the listing above), more than any of the other encyclopedias offer. Both the Chronology, Expeditions and Bibliography sections at the end of Vol II are lengthy and comprehensive. Together they total 61 pages. Pretty impressive quantitatively. NOTE: The author e-mails to say that he's underway on a new version of his encyclopedia. Publisher:	Chichester: John Wiley & Sons, Ltd.
Timeframe:	To nearly the present. Typical Entry: Name (plus birth-death year) or title followed by Text. In case of places, latitude and longitude are given after title. The initials of the contributors are given at the end of each entry. Sometimes 'further reading' appears at end. "An up-to-date and authoritative one-volume reference offering comprehensive coverage of the biology, climatology, oceanography, geology, history and current legal, political and human aspects of the Antarctic continent and the surrounding ocean and islands. Provides essential reading for all researchers and academics working in climatology, oceanography, geology and biology, as well as Polar researchers." This effort by Bernard Stonehouse will, I would suggest, be usurped by the more recent and more comprehensive RIFFENBURGH. There's some similarity in approach: a large number of contributors with entries pulled together by an editor, as opposed to HOWGEGO and STEWART, for instance, which are the work of single authors. A plus is that next to STEWART, this encyclopedia has the largest number of 'historical/cultural' entries, 260. The next largest occurs in TREWBY. These two are also the shortest in overall length and the only single-volume titles. In other words, the entries are relatively numerous but not very lengthy and comprehensive. The Study Guides at the back are perhaps useful for students. 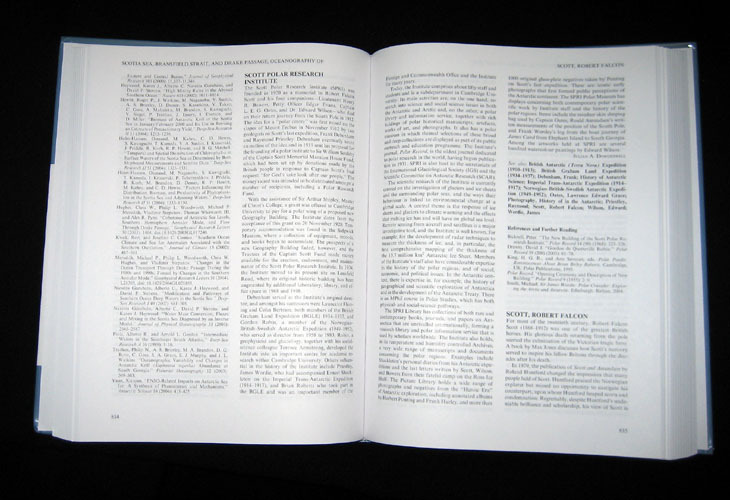 They are essentially summaries of the encyclopedia by subject area with entry titles in bold for referencing. For me, the Study Guide on Exploration is a useful summary. The production is straightforward enough but rather boring as far as the design, typography and maps and illustrations are concerned. The main criticism that can be levelled at the title is its cost which at $425 is far more than it should be. That's the same price as the newer and far bulkier RIFFENBURGH. Fortunately I was able to get a mint secondhand copy for $177 which is still a lot to pay. Publisher:	Auckland, Buffalo, Toronto: FireflyBooks, Ltd.
Illustrations:	Many photographic illustrations (236) in color and black & white. Notes:	More for the general audience. Has advantage of illustrations. Typical Entry:	Name or title followed by Text. The entries are laid out in triple columns throughout with the exception of several double page two- or three-column spreads on specific subjects (icebergs, penguins, etc.). • How was Antarctica formed? • The importance of the scientific work in Antarctica. 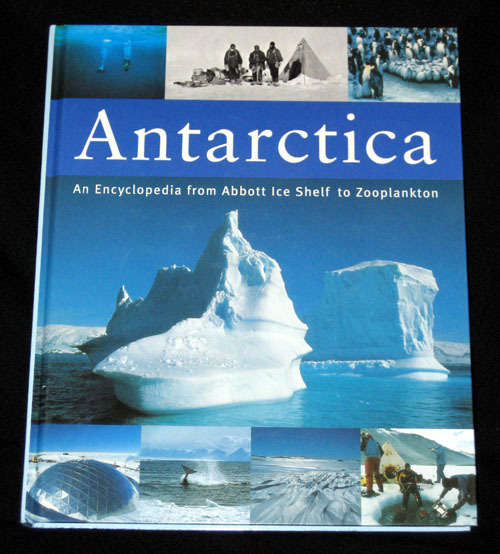 Antarctica: An Encyclopedia from Abbot Ice Shelf to Zooplankton covers the natural wonders, wildlife, explorers, adventurers and discoveries that have been made at the bottom of the world." A handsome addition to a coffee table... a required purchase for libraries. This beautifully illustrated guide to Antarctica features a true encyclopedia layout, with over 1000 concise, alphabetically arranged entries and 250 photographs that cover natural history, climate, geology, tourism, and more. Concise articles...illustrated by fine photographs (many in color) and maps...substantial bibliography... Reasonably priced, recommended for all levels. A highly readable and definitive reference. 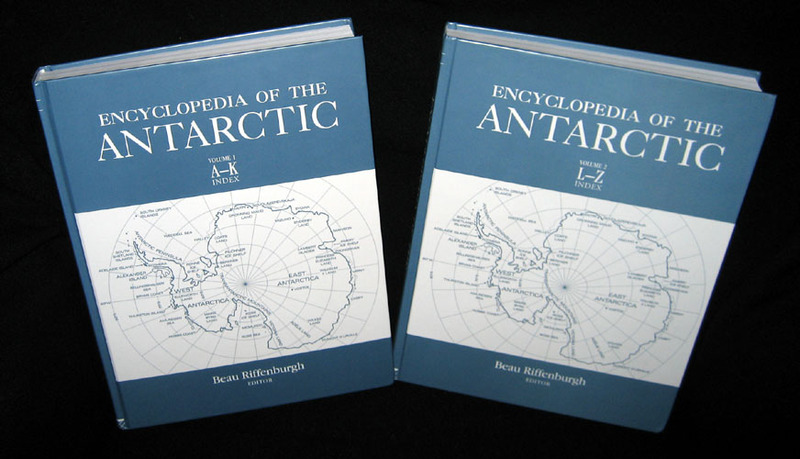 A good basic Antarctica search engine in book form. - Pat Burkette Victoria Times-Colonist 2002 12 01 With nearly 1,000 entries and a wealth of stunning photographs and illustrative maps, this resource will be frequently used to answer both simple and complex questions. Invites readers to browse its pages ... as much a coffee table book as a reference book. Produced by the award-winning documentary company Natural History New Zealand, this book captures the landscape, wildlife and atmosphere of Antarctica as well as the fascinating detail of its history and science. The work of highly qualified researchers was reviewed by a panel of international experts to ensure accuracy, while the mix of historic and modern photographs illustrate every facet of the frozen continent. Without question what jumps out about Mary Trewby's effort is the very affordable price, only $35, by far the lowest price of any of those included here. Given that alone, there's little reason not to purchase a copy. The production is more attractive than some and included are some good photographs, both historical and modern and in color and black and white. It's the shortest of the titles discussed, 192 pages versus the 1,374 of the two HOWGEGO volumes. But there are quite a few 'historical/cultural' entries (163) although their length average about a third of page (only STEWART's are shorter). Some of the entries are disappointedly short of information. The one on Shackleton's Nimrod, for instance, says little more than that it was used by Shackleton and that it was towed by Koonya. Nothing about where or when it was built, how long it was, what happened to it, etc. All six of these titles have pluses and minuses. HOWGEGO is unquestionably the most attractive and best produced, has the most detailed and best written entries and is the most impressive when it comes to what one person can accomplish. On the other hand, it's not exclusively polar. The entries in MILLS are lengthier and more comprehensive than many of the others; both polar regions are included; and the price has come down. It is the only title that is also available in an electronic version. RIFFENBURGH is the newest of the lot and tied for first on price: $425. Only the Antarctic is dealt with. A good combination of science oriented entries and historical/cultural. 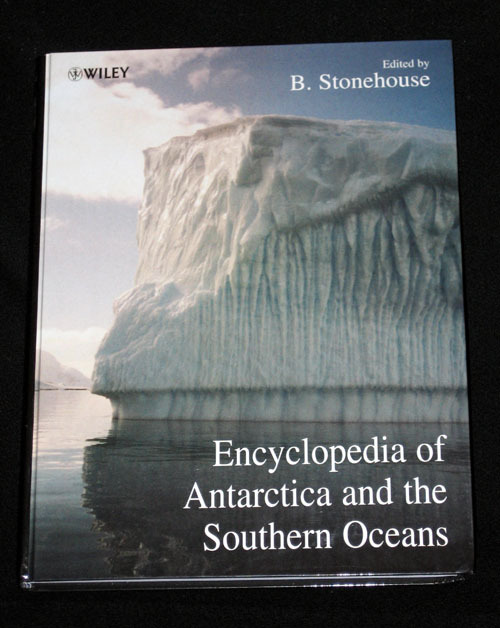 Will probably be the standard Antarctic encyclopedia for some time. STEWART has the advantage of having far and above the most entries and they are all Antarctic oriented. For quick reference, it's the one to have close at hand. Perhaps more errors have crept in than with the other titles. STONEHOUSE is possibly the one to skip mainly because it's the same high price as the newer RIFFENBURGH and is far less comprehensive. It's hard to turn up TREWBY. If it were $150 or $100, one could do without it; but at $35, it belongs on all Antarcticans' shelves.